Mount Vesuvius sits on my chin. You can bet model Denise Richards, who’s the same age as me, hasn’t had to deal with this scale of acne. Mind you, she’s had to deal with Charlie Sheen, which makes us even. 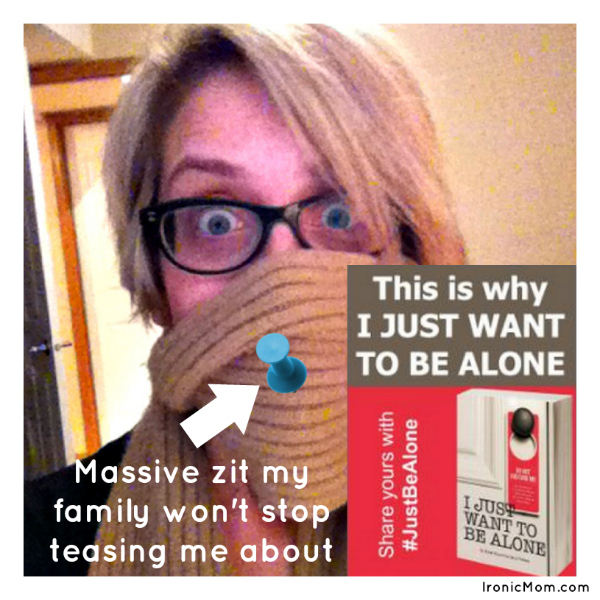 I’d show you an uncensored photo of me and my Zit-pocalypse, but I have standards to uphold on this blog. Below, however, is the censored version. This is how I’ve been walking around my house for the past 36 hours, not including the incubation period, which has been 30 years. UPDATE: Vegas is now taking odds on whether or not our marriage will make it to 13.8 years. I’m thinking of starting a Kickstarter campaign to get a night alone at a hotel. Or an appointment with a dermatologist. Here’s hoping that Mount Vesuvius doesn’t erupt while I’m teaching teens tomorrow. Ooooooh… I grew an EPIC zit on my nose about three weeks ago. The day before a big client meeting. I furiously tried to rid my face of the offending zit… Disasterous results. It looked like I’d been attacked by a raccoon. On top of the zit. Is it better to leave a festering zit alone, or squeeze it? At least you appear to be doing something… but there’s no hiding what it is and it only makes it worse. Well, I recognize myself in this post! I use both anti wrinkle creams and anti products (I usually alternate from one day to the next). Who said the mid/late-thirties would be easy? I meant anti ZIT products in the second half of my sentence. Only 37 and already losing my mind!